For the past three Decembers my crafty wife, Liz, has been a craft vendor at the SOWA holiday market. This year’s holiday market is tomorrow, Saturday the 9th. In the past I went with her and hung around if she needed me. More often than not, she didn’t. So I would take a brisk walk over the Pike to Copley Plaza and Back Bay. 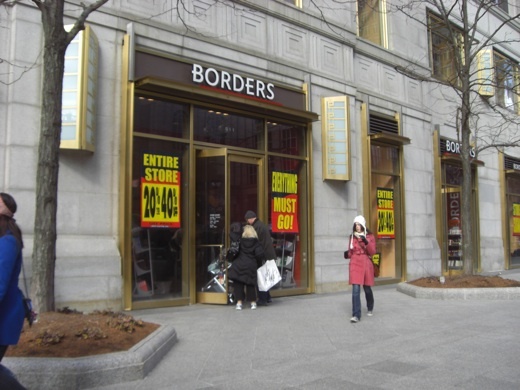 There I would camp out in the Borders on Boylston and do some of my Christmas shopping. I would spend a couple hours browsing the current releases, checking out the new-in-paperback table, and trolling A to Z through paperback fiction. I always had a list of books to buy family members. Luckily for this book lover everyone in my family reads. That includes sisters, bro-in-laws, and, to a degree, niece and nephews. Like any fancy big box book store, this Borders also had a decent collection of graphic novels and movies. This is not a plug for Borders, obviously, since in the past year all Borders locations have been liquidated. Borders was never my favorite bookstore. Borders had no feng sui. I would walk through the front door and be hit with inappropriately placed tables with no flow. Book shelving that was oblique or inconsistent. I smelled a corporate evil amid the stacks. The idea that one person, possibly a committee, decides which books all stores of a franchise should carry is a chilling deception. I know Barnes & Nobel has one buyer, one woman who decides on the book selection. Maybe she has great taste. But no one person should be the arbiter, the gatekeeper, of culture. Well, that’s another argument. We can all go indie if we don’t like it, so there’s no use complaining. So then anyway, that brings us to tomorrow. When I drive Liz into the holiday show, will I stick around for the day as I’ve done the past three years, this time searching for a new store? (I know of a bookstore well up Newbury Street, but that’s a pretty long walk. There may be one or two in the upscale Copley malls.) Or will I turn around and drive out to Brookline or Somerville? The Borders on Boylston was the perfect destination. After I collected my books, I could order a sandwich in the coffee shop (microwaved and rubbery) and of course drink as much Seattle’s Best as I could stomach. Then, dazed, perhaps zapped by consumerism and air freshener and a comprised stomach lining, I’d stumble through the matrix of Boston streets back to the SOWA holiday show to check on Liz. Yes, bookstores are closing every day. And yes eventually those printed pages between covers will become rare. But, publishing is still a big business, and books are still printed and consumed. The generation brought up with Harry Potter and Twilight may be the last to appreciate the experience of waiting on line to buy a new book by their favorite author. It’s all too easy to buy all the books you could want online, or, if you’re not into the analog, download e-books or audio books. Still, for now, books have a place in our consumer society. And there are millions of readers who are unwilling, just yet, to part with them. 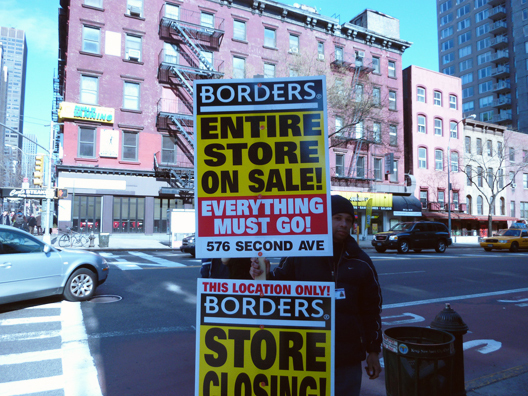 As for Borders, maybe they screwed up. Maybe they dodged left without a plan when Barnes & Noble dodged right with the NOOK. Maybe the marketplace demanded fewer bookstores (although about 40% the Borders locations are being filled with the even more middle-of-the-road Books-a-Million). I was a fan of Borders one time each year, otherwise I would go to Barnes & Noble or, when I had the time to make the drive into Boston, Brookline Booksmith, Porter Square Books, Harvard Bookstore, or Newton to New England Mobil Bookfair, and more often now that my mom is back on the Cape, Main Street Books in Orleans. I do not rejoice when any bookstore goes down. I will miss Borders. Especially tomorrow. But I'll find another bookstore. Hopefully I always will. Sorry Virginia, there is no Borders this year.